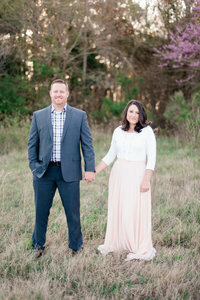 This Engagement Session in Norfolk is everything! We love shooting Norfolk Virginia Engagement Sessions because Norfolk offers such a unique environment from the peninsula. When you do part of a session on top of a parking garage in Norfolk and then head to the Neon district the session is bound to be epic! Then you add on top of that a stunning couple who should models and you have an engagement session that is one for the books! Phil & Brittany have amazing style and carry themselves so well. Brittany chose a gorgeous blue flowy dress that went perfectly with Phil’s stylish black suit. With the backdrop of the city and the industrial feel of the parking garage, their style matched perfectly! After warming up and having fun on top of the parking garage, we headed down to the Neon District in Norfolk. There we met their sweet 3 year old daughter and had a blast capturing some more couples portraits as well as some family pictures. If you have never been to the Neon District, this place is definitely one to check out. Filled with unique pieces of artwork and colored walls that line the street it is such a fun place to do engagement portraits and more. Definitely one of my favorite places to take pictures in Norfolk. Engagement Sessions are a great time to break the ice. Our time with Phil and Brittany was so fun and we walked away having a great time. We always recommend to our couples to take advantage of the engagement session. Time and time again we notice how those that choose to get their engagement session with us feel that much more comfortable with us on the wedding day. The portrait experience with us is not only to receive great pictures but also a time to break the ice. During the session we get to know the couple, understand their personalities and what kind of couple they are. This way on the wedding day we can really draw that out and capture the essence of their relationship. By doing doing an session before the wedding we end up showing up as friends on the wedding day instead of strangers with cameras. And this benefits everyone involved! Thank you Phil & Brittany for trusting us to capture this incredible time! We are so excited for you both and wish you both an incredible wedding day! « Podcasted When A Wedding Went Viral and More!